It's the 15th Annual funbeach/Half-Canadian Event Weekend, and you're invited! 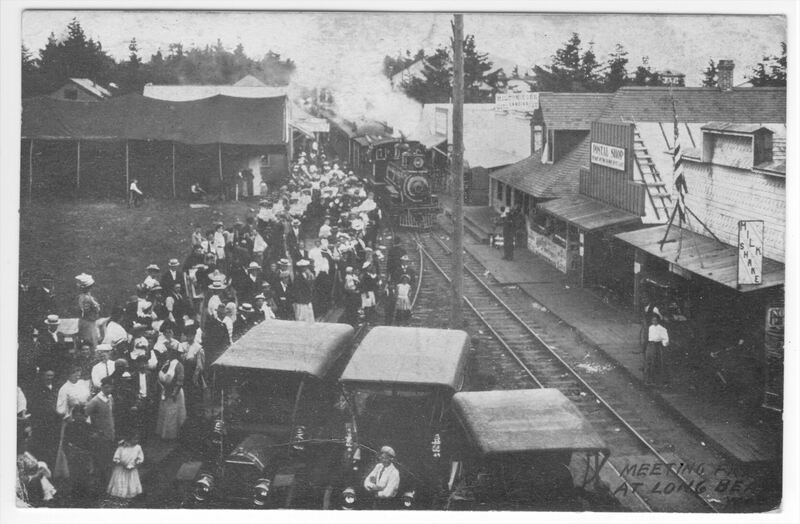 This year's event highlights the history of the beloved Clamshell Railroad that transported people, oysters, cranberries and more up and down the Long Beach Peninsula before there were paved roads! Known as the train that ran by the tide table, not by the time table, you'll retrace the whistle stops and learn about the early days of transportation out here at the "end of the road". Things kick off with a morning check-in at the posted coordinates, the Long Beach Veteran's Field bandstand on Saturday, September 15 from 7:30 - 9:00 am. There, you'll check in and pick up your registration materials, sign the logbook, and grab a cup of joe before heading out for a fun-filled caching day looking for new geocaches hidden just in time for the event. This year's event will include a special trackable geocoin that you can earn by finding special themed geocaches placed in conjunction with the event. In order to collect your geocoin at the Saturday evening wrap-up dinner, you must pre-register at the website link below! There will be so much to do that weekend, it won't fit on one geocaching page, so be sure to head log your "Will Attend" here before heading over to the official Cache Dash Splash website for all the details -- remember, you must pre-register there to help us get ready for the big weekend and to earn your trackable geocoin! Things kick off with Friday evening (The Dining Car - GC7P2P7), Saturday morning (All Aboard - GC7P336), Saturday evening (Tickets Please! (GC7P33H), Sunday morning (Whistle Stop Breakfast (GC7KCYZ), and a Sunday CITO event (The Caboose - GC7PG6W), and fun bonus stuff and contests planned for the weekend! In addition to the events and the new geocaches, you'll be able to tour the Nahcotta Saturday from 10:00 am to 2:00 pm, a restored passenger car from the Clamshell Railroad, which is normally only available for viewing to the public once per year. This special viewing is in cooperation with the Columbia Pacific Heritage Museum, and admission will only be available with the laminated nametag you'll pick up at Saturday morning's check-in. As part of the viewing, keep your eyes peeled for special temporary clues within the display area, which will lead you to a loggable cache and prizes located nearby! Published with special permission from Groundspeak, Inc.